Today I will describe how you can perform a Magento 2 upgrade. When you run an eCommerce store it is vital to stay secure and up to date. You should always look out for the latest M2 version and update promptly. A word of advice: always backup your files and database before attempting an upgrade. With a platform as complex as Magento 2 you can’t anticipate what is going to happen next. A lot of things might go wrong. You better have a way to go back. Magento composer update. That is using Composer, a terminal command line program. 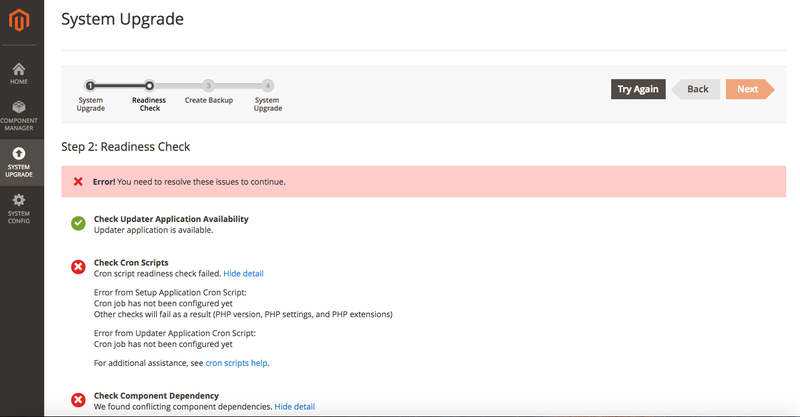 Upgrade Magento from admin using the Web Setup Wizard. Copy the Magento 2 latest version over the old installation. Composer is a dependency manager for PHP. It can help you update your store with minimum hassle. It will install Composer systemwide for every user to run. You can always ask your system administrator for assistance. One thing to remember: username is a public key and password is a private key. That is one of the ways Magento might confuse you. Replace 2.2.5 with the latest M2 version. This is it. You’ve successfully performed a Magento 2 upgrade! 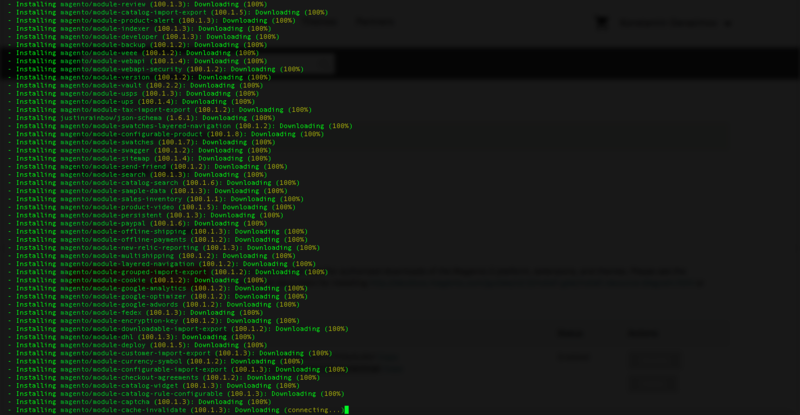 Now go to the frontend and backend and check everything. NB: Composer might complain about some PHP extensions not being downloaded. You might want to install them in order to proceed. Magento 2 has a menu option under System > Tools called Web Setup Wizard. You can use it to install extensions bought via the Magento Marketplace. You can also use it to upgrade Magento. NB: There might not be such a link in your installation. That is a bug which is not fixed as of Magento 2.1.8. Other times the link might disappear after your migrated from Magento 1. Go to http://shop.com/admin_xxx/admin/backendapp/redirect/app/setup/. http://shop.com/admin_xxx is path your backend. You will be automatically redirected to http://shop.com/setup/#/home. There you will select System Upgrade. Click on System Upgrade and follow instructions. They are self-explanatory. If Show All Versions is checked you can upgrade to unstable development releases. I suggest you backup your files and database manually. Skip Create Backup step. It might hang and you will need to start over. Upgrade this way if the previous two failed for whatever reason. Download the latest Magento 2 off the official website. Unzip it in your magento main folder. That will overwrite the core files with the new ones. That will upgrade database, compile and deploy static content. It might require some time depending on the number of products, orders and customers you have. Upgrade is done. Head to frontend and backend and see if everything looks normal. Should I update my theme after an upgrade? If it’s a custom-made theme you should definitely contact its developers and ask them to audit it. Tell them you just upgraded M2 and you are not sure if the theme will play well with the current Magento version. If you purchased a premade theme the vendor usually releases patches for every new M2 version that comes out. Go to templatemonster.com or the site you bought your theme from and see if there are updates available for download. It is important that you check your Magento frontend pages for any misaligned or missing content. A Magento 2 upgrade can cause serious damage to the look of your website. What if things go the wrong way? As with everything in Magento, an upgrade is easier said than done. Below I put together the various errors (and suggested fixes) that might happen during the Magento 2 upgrade process. There is no real explanation of the issue and you might wonder how to fix it. From my experience dependency conflict in most cases is caused by a third-party extension depending on some old Magento 2 component. 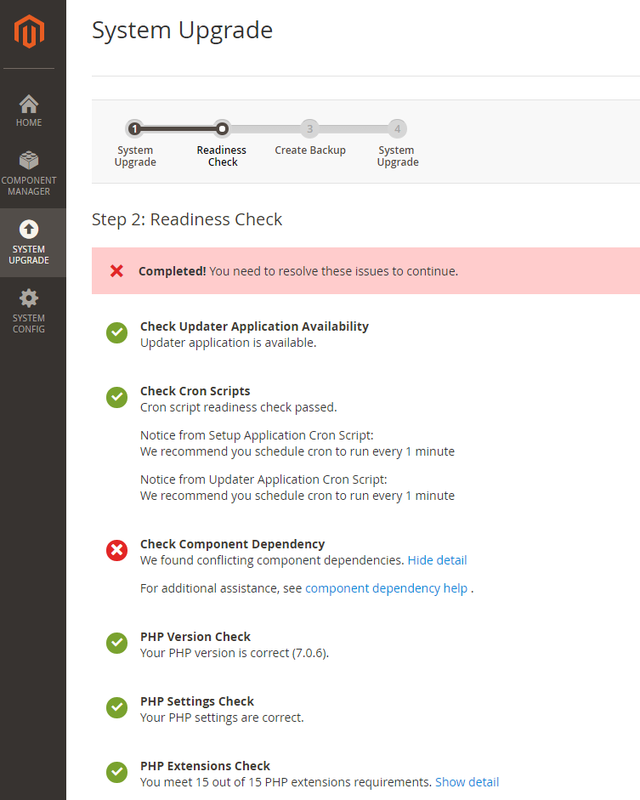 Perform an update to the latest Magento version. In some cases the conflict is caused by a changed composer.json file. Try and restore composer.json to the original version and run Setup Wizard one more time. Change permissions of var and pub folder to 777 (chmod -R 777 var pub). If you encounter this error during an upgrade it means there is not enough RAM allocated to PHP processes. Contact your system administrator and ask him/her to increase memory limit to at least 2 Gs. Of course that means you cannot safely run Magento 2 on a server with less than 2G of available RAM. You should upgrade your plan to meet the minimal hardware requirements. This is a generic message that might not be helpful. 3. Inspect your composer.json file. Sometimes an error there might cause a Magento 2 upgrade command to throw the"no commands defined" exception. From my experience this is mostly related to some custom module having a problem. Try to inspect every one of them to see if you could spot an error. Try to delete every custom module, update your instance and install them back. Sometimes clearing generated (the latest 2.2.x versions) or var/di, var/generation (in case of an older Magento 2.1 upgrade) folders helps. Bonus: Can I downgrade Magento 2 the same way I upgrade? You should follow step 1 and downgrade with Composer. Just put the version number you would like to have and repeat everything else. I have tried this method and successfully downgraded 2.1.8 to 2.1.6. I don't think you can use the Web Setup Wizard, but I am sure you can follow step 3 to downgrade M2. I hope now you have learned how to upgrade Magento 2 to the latest version. At least I hope I managed to explain it well in this article. If you have any questions you are more than welcome to ask them at the bottom of this page. Do you know Magento 2 can be slow? And slow checkout leads to sloppy conversion rates. Check these 34 ways to improve Magento 2 & 1 performance. Contact an expert to make your Magento faster. Do you need a Magento 2 update? Contact me today for a free quote! • Make a full backup of your Magento 1 store including all files, folders, and the database. • Create a clone of your Magento 1 store. Do not use the live store for Magento migration process. • Analyze your store. Keep what you think is necessary and delete the rest. • Check whether your current theme(s), extensions and custom code are compatible with the Magento 2. • Migrate the data from the cloned database of your Magento 1 store. • Remove outdated and useless data from the database. This includes logs, recently viewed products, compared products. • To make Magento migration process as hassle-free as possible, install a fresh copy of Magento 2 on the same hosting server where your Magento 1 store is located. Good tips to upgrade the Magento! Many people want to upgrade their Magento with the higher version. After visiting this article, they can have a rough idea of upgrading their Magento versions! Looking to visit this article more often in the future!